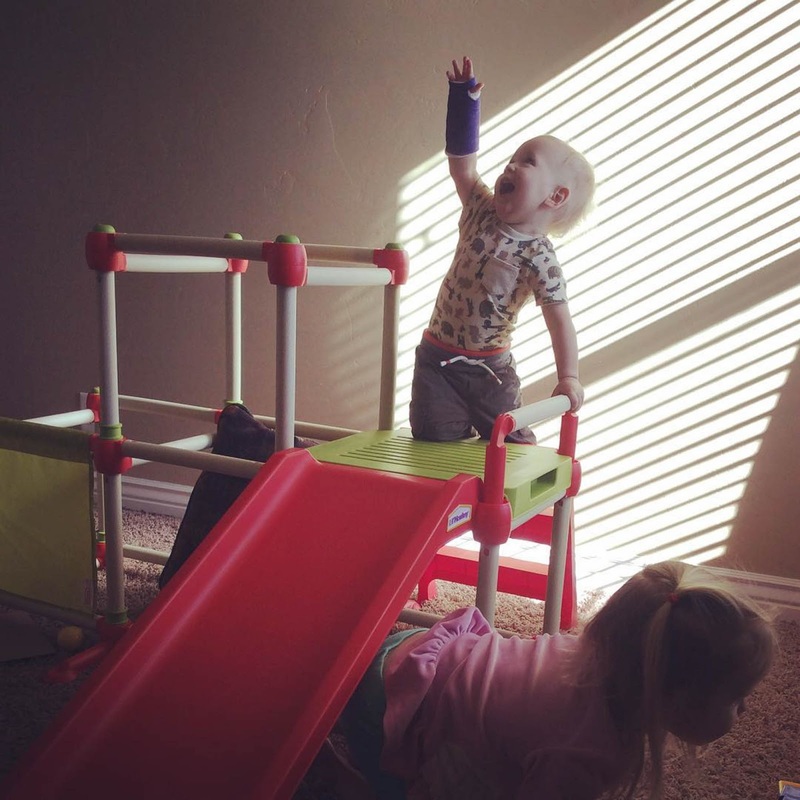 Alexander should be getting his cast off tomorrow, fingers crossed. When he first got it on my friend Kari warned me that it would be so stinky by the end. Her baby boy broke his arm at our neighbourhood playground in Durham while I was teaching swimming lessons to his older brothers. He fell off the wiggly bridge and cried and cried and cried—the same other-worldly wails Alexander was making when he broke his arm. He ended up pulling off his cast while in his crib one day and it was so close to the time he was supposed to get it off anyway that the doctor decided to just let it be. I don't doubt that his cast was stinky at the end of four weeks—four hot, humid weeks in the middle of a typical southern summer! Alexander's cast really doesn't smell very badly (at least not that I can tell from the little sniffs I've given it), but we've only had to endure four chilly, dry, bleak mid-winter weeks. I'm sure it would smell worse under other circumstances. We've done pretty well at keeping it clean—always slinging it up in an old grocery bag when he eats and so forth—but it's still getting pretty grungy. He's been pulling the stuffing out of his thumb hole, the purple has about rubbed off the palm of his cast from all his crawling around, and it's just pretty dingy-looking. It will be nice to have it come off! The other day when we were getting ready to leave for Grandpa Frank's 90th birthday party (which was on Saturday although his birthday wasn't technically until today (he's birthday buddies with my brother, David)), Alexander gave me quite a scare. It's days like today, when I'm so totally ready for spring, that I'm glad I live where I do because we had a beautiful prelude-to-spring day here. It was a balmy 57°F, the sun felt warm, the breeze was gentle, and the long-silent playground echoed with children's laughter. Four of those laughing children were my own (the fifth was at her organ lesson). We soaked up every possible minute at the playground before coming home to make dinner. My cousins—Michelle and Shannon—meanwhile, were on Facebook comparing temperatures where they live—in North Dakota and Idaho, respectively—and although I know that I tolerated living in such cold places for years, seeing those -17°F and -7°F (again respectively) temperatures made me shudder. At the same time, it's days like today, when I'm still wearing fuzzy socks and a jacket to the park, that I'm glad to be moving back to the south. I don't think I ever quite adjusted to the cold weather up here. The playground was full of children—and parents—in t-shirts and shorts, and though I know that I have run outside to play on the first warm day towards the end of winter wearing similar attire, today I stood out a bit in my puffy jacket and fuzzy socks. Rachel was in charge of our Family Home Evening lesson today. We told her to look at the Come Follow Me manual and go to town. So she did. She prepared a fabulous lesson...for last week. It didn't take us very long to figure out her "guess the topic" hangman opener because, well, The Sermon on the Mount was pretty easy to figure out since we learned about it last week. But we went ahead and had her give her lesson anyway and we had some good discussions. At the end of her lesson she passed around paper and pencils to everyone and asked us to write down something we thought was interesting from the lesson and then she collected them and read them out loud. This was actually a very entertaining thing to do because even though we all wrote down serious, well-thought-out answers, some answers were easily misconstrued to be silly. For example, when she got to Andrew's she couldn't quite read his writing, which is, to be honest, perfectly fair. His writing is so poor it could rival any medical doctor in an "illegible prescription" contest. It's simply awful. He once suggested to me that I keep a pen and paper by the bed so that I could jot ideas down there, rather than take notes on my phone (I think I'd had some autocorrect issues with some things I'd typed when I checked my notes in the morning) and I was like, "Please tell me you don't do that!" He enlists my help in deciphering things he writes down in the middle of the day! I can't imagine trying to work out his middle-of-the-night scrawlings! Anyway, she got to his paper and read, "The...Satan gives us a...good pattern for life. What!? Who wrote this!?!" "Must've been Dad, I think," I said, because he was already cracking up over her misinterpretation. "Not Satan!" he finally choked out. "S-O-T-M! S-O-T-M! The Sermon on the Mount!" We like to turn as much as we can into acronyms at our house and had his writing actually been legible she might have been able to piece together what he was trying to say, but his sloppy O turned into an A and his sloppy M morphed into what was possibly an AN. Then she pulled out Benjamin's passive-aggressive note, which said (in beautiful, well-controlled six-year-old handwriting), "reading the sermin on the mont AGAIN" and we all burst out laughing. We're a week behind in Come Follow Me now, but it was a good lesson. On Friday night Rachel went to a sleepover and the rest of us were itching for something to do so we headed to BYU for their "Nights at the Museum" activity. I wasn't quite sure what to expect, other than knowing that the museums were open extra late, but when we arrived we were handed a paper with a scavenger hunt of sorts. The employee gave us the hook—that if we finished the scavenger hunt by visiting all five museums we would win a water bottle—and the kids (Benjamin, especially) were sold. Our first museum was the Museum of Peoples and Cultures. In addition to the regular exhibit they also had the back of the museum open and had booths set up with students exhibiting their work. One of the exhibits was on Nabatean pottery from Petra—they have some of the thinnest pottery found in the world and no one quite knows how they were able to make it so thin. It was kind of fun to get to talk with the students about pottery after reading Uncle Patrick's paper on pottery. Next we hit up the Paleontology Museum, which was by far Alexander's favourite. We really need to take him back there when it's a little less crowded (and a little less past his bed time). This morning I went to a meeting with some of the curriculum committee members for our school district. Such a thing might seem somewhat pointless since we're moving at the end of the school year, but my friend, who is in charge (as a parent volunteer) of the "gifted" program at our school was asked to come in and meet with the committee because she'd been asking them so many questions. She didn't want to meet with the committee alone because she was afraid she'd buckle under pressure, so she asked a couple other parents to come in with her. Zoë had preschool, so I just sent her off pretty much as I normally would on a Wednesday morning, and I asked my ministering sister to watch Alexander for me. She bravely said she would. Actually, she's offered over and over again to watch Alexander but I've been too nervous to leave him with her because he's a screamer. Anyway, he did fine for her! After I dropped him off at her house, he screamed and screamed and screamed until she loaded him into her car to go to brunch with her friends (at a fast food joint with a kiddie area; she also brought her preschooler). She said he sat on her lap perfectly calm the entire time they were at the restaurant. And then he started screaming again the minute she started buckling him back into his car seat to bring him back to me. So, all in all, he did much better than I expected. The meeting went well, and my friend got all her questions answered and I learned a bit about how the gifted and talented program works. I felt a little silly if they asked me if Rachel was in the advanced math group. I was like, "Yeah. I don't even know. I, uh, know she's doing fine. It's been quite the year for us." I had a series of Zoë stories lined up to share, one of which is how she found a toilet paper roll and put it on her arm like a cast (because she might be a teensy bit jealous/curious about her brother's cast). 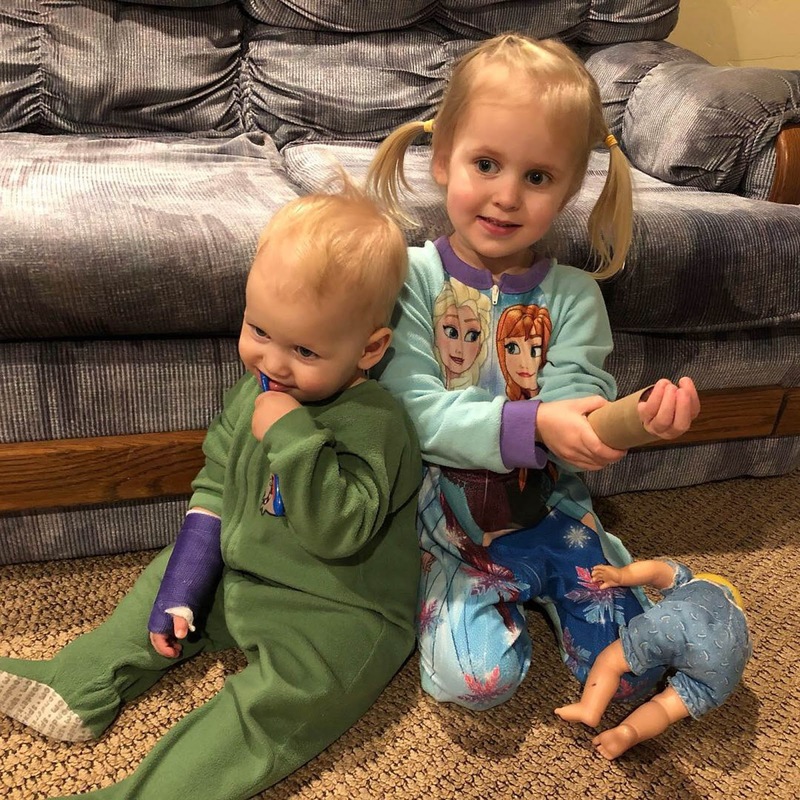 But instead of telling you about her cuteness I'm only going to share pictures of her with her cardboard cast and complain about the healthcare industry a little bit. 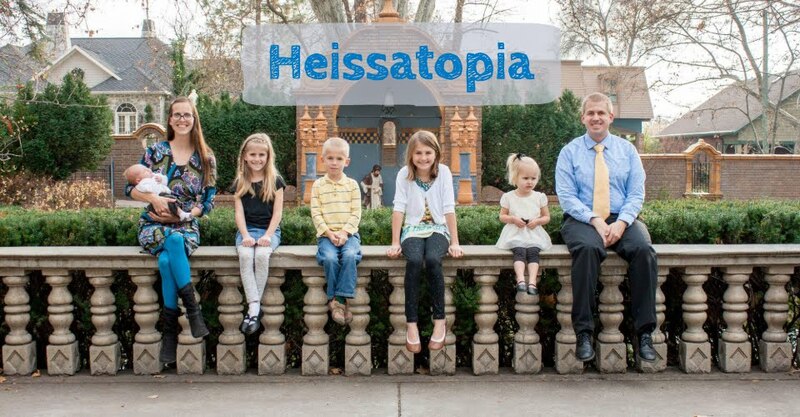 This afternoon Rachel and I went to the temple to do baptisms with some friends of ours. We haven't taken Rachel to the temple yet because we've heard horror stories about the wait times to do baptisms. People were waiting sometimes four hours. We didn't see how it would be possible to coordinate a babysitter for an unknown period of time. My friend who went with us said she just asked one of the Laurels (a young woman from our congregation between the age of 16 and 18 (or going on 16 these days)) to babysit for their younger kids and since this particular Laurel knew how crowded the temple has been lately they just told her that they didn't know when they'd be back. That's all well and fine when your youngest is six (as my friend's youngest is). It's less well and fine when your youngest is one (and still a nursling at that). Going out—for any reason—is just complicated with babies. So this afternoon I left the kids in Andrew's care and Rachel and I went to the temple (because it's one thing to leave your baby with your husband for however long versus leaving your baby with a stranger for however long; I mean, the baby will still scream but Daddy can handle it). We lucked out, though, and the baptistry was really quite empty when we got there. We hardly had to wait at all, but soon the waiting room was full so we were glad we got there when we did! We breezed right through. It was wonderful to get to spend some one-on-one time with Rachel and to visit the baptistry again. I haven't done baptisms for the dead since Andrew and I got married (we went weekly back when we were dating/engaged but then we had other things to do in the temple). Rachel got to take five family names to be baptized and confirmed for, mostly from my paternal grandmother's side—Naomi Ruth Chason, for example, who was born in Cairo, Georgia (over a hundred years ago)! I hope Rachel had a wonderful time as well. It was nice to be in a quiet, distraction-free place for a while where we can sit and soak up stillness and peace and think about our relationship with Heavenly Father. This was a busy (and rather dichotomous) holiday for us, abounding in revelry but not without sorrow. I was in charge of three Valentine's Day parties this year, which was a lot and had me feeling rather stressed out. I knocked the preschool party out on the 13th. Since I had the preschool kiddos last week as well as this week, I was able to stretch a project out over two weeks. 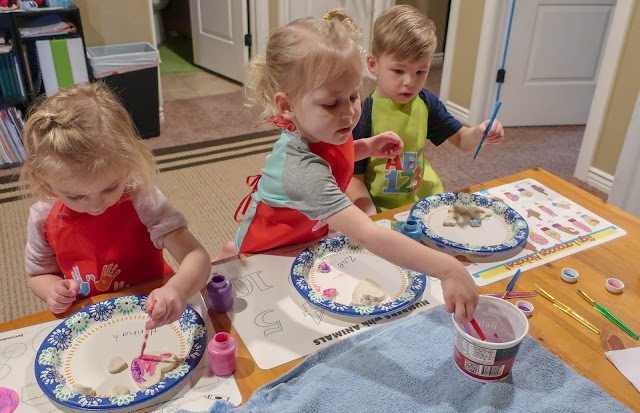 I had the kids cut some hearts out of salt dough last week and this week we painted them (we did that first thing in the morning so that they would have plenty of time to dry before it was time to go home). Late in October, Karen was on the phone with her sister Linda and Linda mentioned how she was just looking at tickets for Wicked. 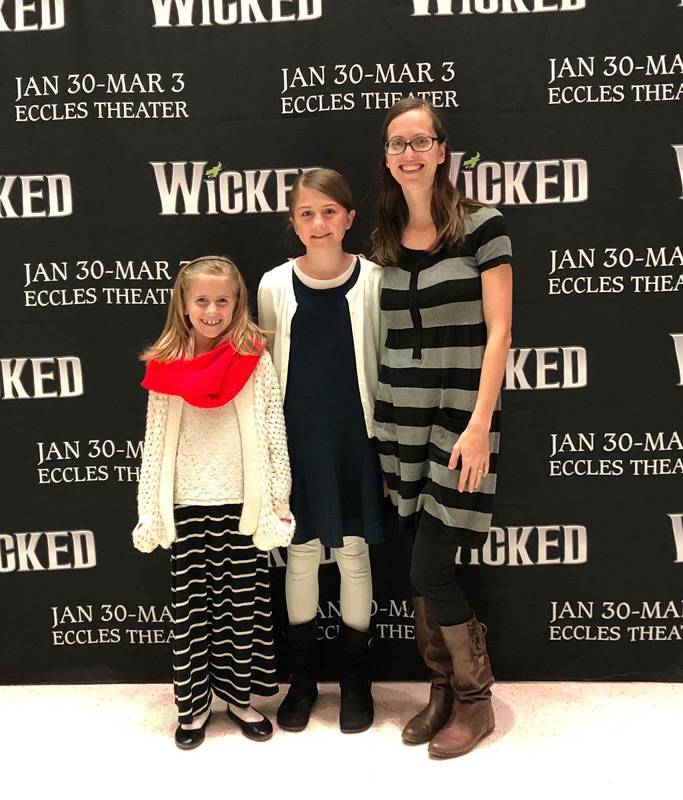 Karen enjoyed musicals and rather liked Wicked so she asked Linda to book a few tickets for her—because Reid doesn't particularly like Wicked Karen decided she'd invite Rachel and Miriam to join her. She asked me in secret if it would be alright if she took them and I said that of course it would be! So she booked the tickets and was planning on gifting them to the girls for Christmas. Both girls love the musical and have been singing the songs since they could talk, basically, so I knew they'd be very excited when they opened them. Karen wrote out the check to Linda on Thursday, November 1. And then, well...you know. We took her to the hospital that Saturday and by Thursday, November 8 we were all preparing to say goodbye to her, which we did in the wee hours of the morning on Friday, November 9. We still gave the girls the tickets, but instead of going on an outing with Grandma, the girls went on an outing with me (and Aunt Linda and Aunt Dorothy and cousin Michelle and Aunt Dorothy's college roommate). We had such a fun evening together, though it was also tinged with sadness knowing the intended recipient of my ticket. It felt odd to be driving home in the middle of the night, feeling exhilarated by the wonderful performance when I thought about how incapacitated with shock we'd felt driving around in the middle of the night (to and from the hospital) three months previous. 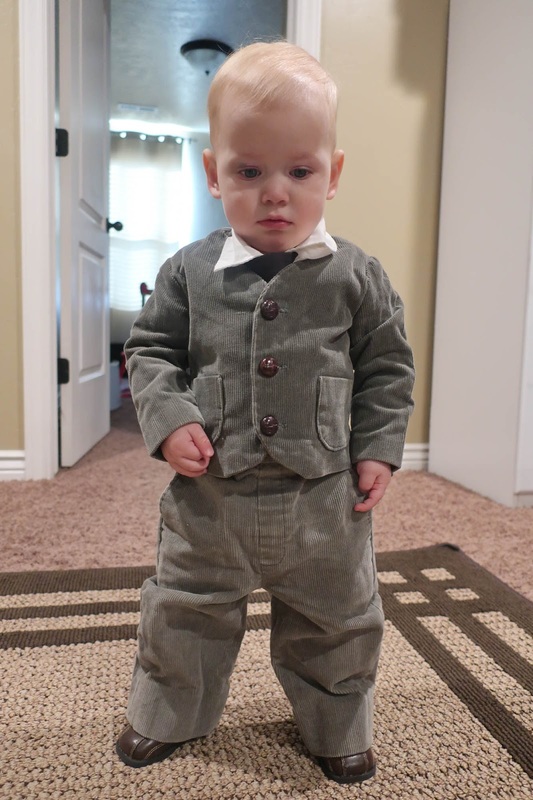 It was an amazing grand finale of Christmas presents from Grandma, though! We had such an amazing time! Linda drove us all into the city (us being me, Rachel, Miriam, and Dorothy; in our van). We parked at City Creek (in section D1) and then walked down to Mollie & Ollie where we met Michelle and Dorothy's roommate, a recently retired music educator (who plays the viola). "We chose a very healthy restaurant," Linda told me. "Because you're with us. Dorothy's a little upset that we can't go to Cheesecake Factory but I wanted to make sure there was something on the menu that you could eat." I told her that Cheesecake Factory would have been fine (though I don't know if I've ever been there, either (there are a lot of places I haven't eaten at (our motto is: eating at home saves money (and we've been pinching pennies since forever, sooo...))). I have this weird reputation as the family hippy because I do things like eat vegetables. But I like desserts as well. And burgers. And stuff. Anyway, since everyone else was already waiting for us at Mollie & Ollie's, that's where we went and my girls and I thoroughly enjoyed it (though I'm not sure anyone else did). Miriam and I both got the teriyaki chicken bowls and Rachel got a ginormous pulled pork wrap (which she ate up lickety-split, and then ate about half of Miriam's teriyaki bowl). It was just a quick walk from the restaurant to Eccles Theater. 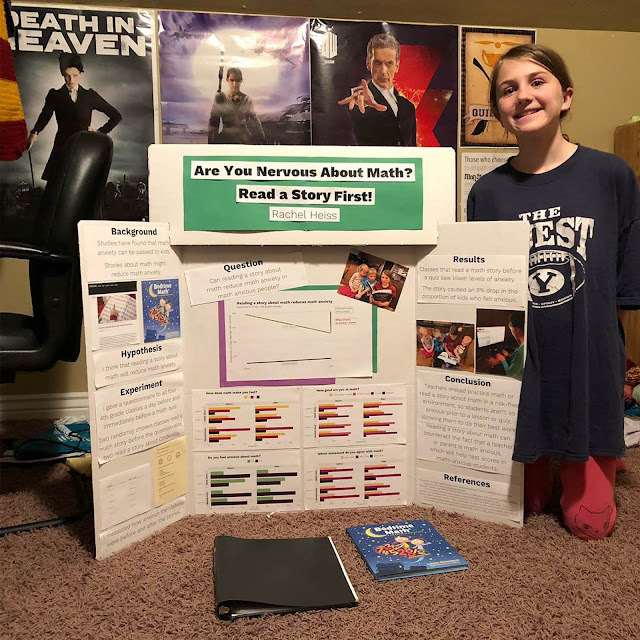 For the science fair this year, Rachel did a study on the fourth-grade classes at her school to test whether or not reading a story and doing practice math problems (from a book called Bedtime Math) would reduce math anxiety in the classroom. I'll admit it was one of my contributions during our "what in the world should Rachel do for the Science Fair sessions," inspired by some background research I've been doing for a story idea I had, which in turn was inspired by a late-night nursing session following a late-night math review session. I've had math on the brain lately and my story idea is, I think, hilarious. I told it to the older girls early in January and they spent the entire morning watching the kids so that I could finish writing it down. They want to see it as a book right away, but it still needs some work. And I need to figure out how to pitch it. But this is all besides the point. Rachel had the four grade four classrooms fill out a survey about their feelings toward math, and then had the classrooms read either a story from Bedtime Math (the test group) or a fairy tale (the control group), told them they were going to have a pop quiz, and then administered the same survey about math anxiety (and then gave them a pop quiz). She found that the classes that had read the math story experienced an 8.4% decrease in math anxiety, even right before a pop quiz! The class that read the fairy tale saw a slight increase in math anxiety. There was not a statistically significant difference in scoring, but with a long-er term study it's possible a change in scores could be tracked. Her study gave similar results to some more long-term studies done by actual scientists (which she talked about in her paper). She suggests that teachers get in the habit of doing math warm-ups in a risk-free environment, prior to a math lesson or examination, in order to allow math-anxious children to do their best work. Winter has me feeling so bored that I haven't felt like I've had very much to write about (it's also been an insanely busy week; I've spent hours editing papers or helping with science fair projects that I guess I could have been writing), but then I saw these pictures on my computer and remembered that we actually left the house to do some adventuring this past week! It got so warm, actually, that we even went on our first family walk of the year this week. We haven't managed to go on many (uhhh...any) because our schedule is kind of wonky this semester, with T/W/Th being a marathon of craziness. By the time Andrew gets home it's either hours past the kids' bedtime or late enough in the evening that it's too chilly to enjoy a walk outside (that isn't to say that we aren't ever walking, just that we haven't all been out walking together, which is the definition of a family walk). But we did manage a walk this week and, I suppose, we could count our Saturday outing as a walk as well. 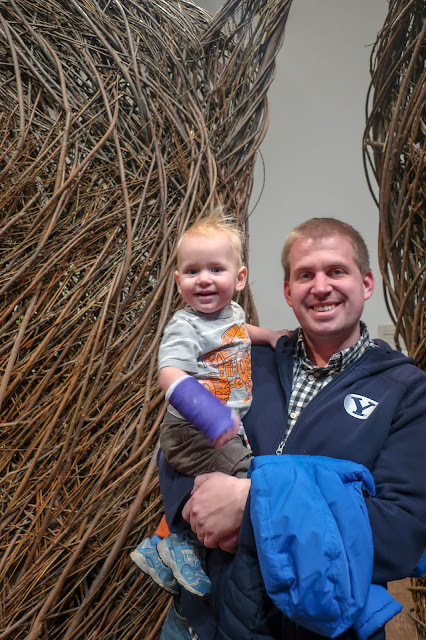 We decided to hit up Patrick Dougherty's exhibit at BYU's Museum of Art. Dougherty is an artist from North Carolina whose work my little North Carolinian children know and love. In fact, they are huge fans of his! He is the man behind the twisted twiggy pathway in the Hideaway Woods at the Museum of Life and Science in Durham where my bigger kids spent many happy childhood hours. It was fun to get to watch this exhibit take shape last semester (as we'd walk through the MOA on our way to organ lessons) and we figured it was high time we take the kids to visit it just for the sake of visiting. It was like a little taste of North Carolina, right here at BYU! 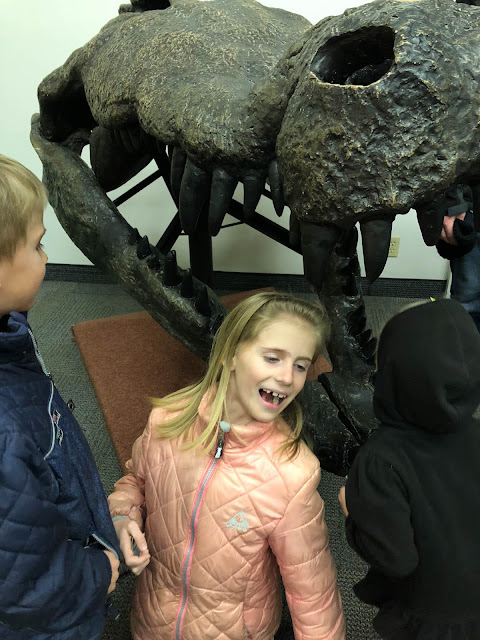 The kids had so much fun playing a little hide-and-seek in the structures (and it was nice to have such a child-friendly exhibit at the museum). Winter is giving us a bit of a reprieve right now, which is rather kind of it. I don't hate winter as much as I used to, it's still not my favourite season, but I don't loathe it like I used to. Part of me wonders if this change has more to do with my latitude or with my age or with global warming in general, but the grip of winter simply doesn't seem as strong as it once was. It used to seem to drag on forever, but now it's clipping along at the regular rate of (as my Uncle Bruce might say) one second per second. Still, it's nice to get outside without a million layers on and without slipping on ice so we've been making the most of it while we can because we know there'll be a few more storms before spring (at least, one can hope). We've been doing a lot of scooter-walks after school when the weather is warmest. I was so excited to get the kids scooters for Easter last year and they were, too...until they tried them out. Then they had nothing but complaints—their legs were tired, it was hard to balance, they can't steer—and we ended up with a few pretty good wipe outs. Rachel and Miriam got decent on them, but still didn't ride them very often. Benjamin was so bad it wasn't even funny. "Just gliiiiiiide!" I'd urge him while practicing (and practicing and practicing) in the church parking lot. He wouldn't glide. He wouldn't balance. He'd just do this weird waddle-scoot thing that I totally agreed looked like a lot of unnecessary work. No wonder riding scooters wasn't very fun. But somehow he figured it out—I don't know when, I don't know how—and this boy is a scootering machine now! He always wants to go out on his scooter. He zooms around, uphill and down, he rides far, far ahead of me and then circles back. It's been an amazing transformation.